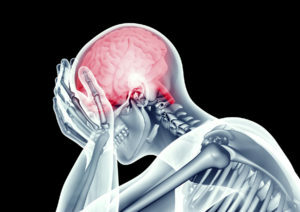 Concussion is a traumatic brain injury (TBI) from an impact to the head or injury to the body that shakes the brain. Neurons, or nerve cells, living in the brain can be damaged causing inflammation and a disruption in brain function. Symptoms often resolve but sometimes can linger and become what is known as Post Concussion (or Concussive) Syndrome (PCS). In many cases, patients are told to simply “wait it out” and that there is not much that can be done. Conventional treatment usually consists of pharmaceutical medication to alleviate symptoms, but these treatments have side effects and often don’t address the source of the problem. Cognitive therapy can be helpful in cases involving personality, concentration and memory changes. According to the Mayo Clinic, most headaches associated with PCS are actually tension headaches that result from neck injury that occurred along with the head trauma. This can be due to connective tissue/fascial tension, muscle tension and/or trigger points, joint dysfunction, nerve irritation in the neck and head. A blow to the head will directly affect the cervical spine (neck), thoracic spine (upper back), TMJ, and shoulders. These regions must be evaluated and addressed as a whole functional unit instead of individual parts each doing their own thing. In the event of a head trauma, always obtain a medical evaluation to rule out severe or dangerous conditions. These are rare, but important to be aware of and to address immediately. It is also important to note that if playing a sport and a concussion is sustained, the athlete should NOT return to play until properly cleared by a physician. The brain is very sensitive during this time and is vulnerable to more serious injury or damage. Acupuncture influences the brain and can help to regulate function post injury. It has a very calming effect and has been shown to be effective in treating headaches associated with TBI. Manual soft tissue techniques such as Fascial Manipulation and Active Release Techniques can help to release tension in the fascial and muscles of the head and neck. Most people typically do not consider the soft tissues of the head and face, but our skull is covered in fascia and muscle. These tissues can certainly hold a lot of tension which can cause local and radiating pain. These tension points must be released in order to resolve the condition. Chiropractic manipulation can help to mobilize the joints in the cervical spine and normalize the mechanics allowing for better movement and function. Nutritional supplementation to resolve inflammation and support brain and connective tissue function. Common supplements that are often helpful are magnesium, curcumin, essential fatty acids from fish oil and resveratrol. Always consult with your physician and a professional trained in the use of supplements before beginning any supplementation program to be sure it is safe and appropriate for you. It is also important to note to not take fish oil supplements if taking anticoagulant medication especially in the event of a brain injury. If you have had a concussion or head trauma and are experiencing symptoms, seek the guidance of a professional who can properly diagnose and help you. Ask about these natural, safe options that are available and take back your life.